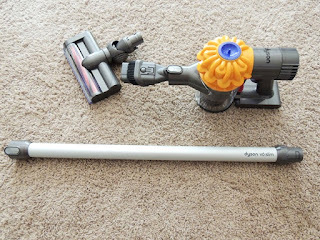 Dyson V6 Slim Vacuum Review! Best Product of 2015 that was reviewed by Free For All! Free For All received a sample to facilitate this review all opinions are 100 percent my own. My new Dyson V6 Slim Cordless Vacuum finally this is definitely a Free For All Best of 2015 product. This is one of my favorite products I've reviewed and it does not disappoint. 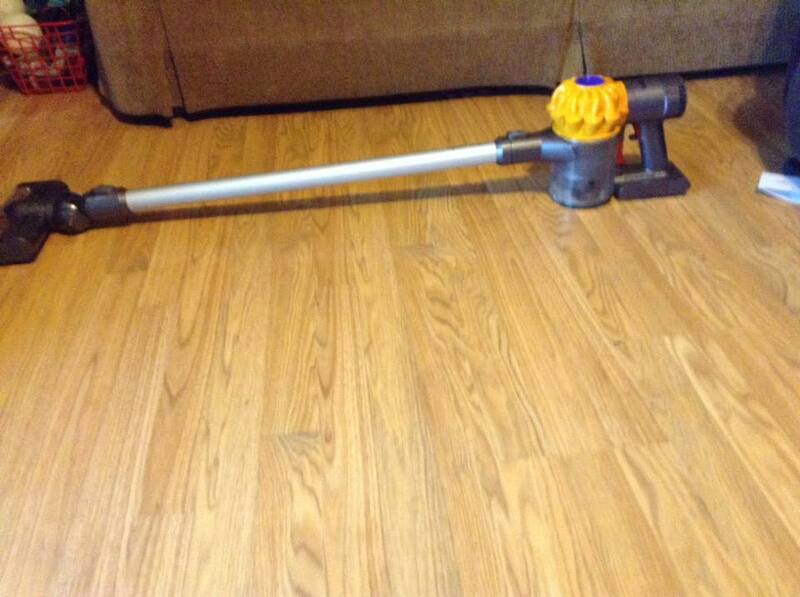 This is probably the best vacuum for my household. We have so much linoleum to clean it isn't even funny, the only room with carpet is my living room which I soon plan to change at tax time. I've needed a new vacuum for quite sometime, but I couldn't bring myself to pay a lot of money for a vacuum I felt I would rarely use. So, when the opportunity arose for me to review this Dyson I jumped at the chance. I was so wrong about rarely using a Dyson V6 Slim now it is all I use! 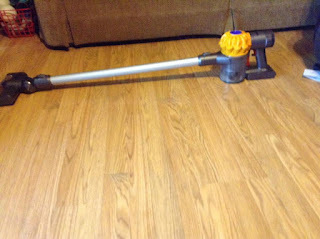 Finding a vacuum that would work just as good on linoleum as it does carpets is what I wanted since we have both. This vacuum works magic on both. I've used it every day since it arrived. It is just so simple and easy The first thing that caught my eye was the slim design. I don't like big, bulky vacuums that take up a lot of room; I'm not very big and they are just to heavy and I detest dragging them around. The Dyson V6 comes with a holding tray that you can screw on your wall and easily store it. I hang mine up in my utility room and it fits perfect. Its also cordless which is a huge plus. How amazing is that? I am in awe at the cordless vacuum uses. I admit there's been plenty of times that my floors needed cleaned bad, but I was just too lazy to deal with getting out my big vacuum, unravel the cord and then twist it back up when I was done. So that part is a big plus in my book. When it needs charged you just plug the charger in and it is ready to rock and roll! Make sure to follow Dyson on social media below and be sure to check out the Dyson V6 Slim right now Wal Mart even has layaway so if this is a big purchase for you put it on layaway and make payments. I just love Dyson, they pick up the littlest of things. I know some people swear by Shark but I had a shark that worked well initially but after just a few months it just stopped working. Total waste of my money. I like the slim and sleek design of this vacuum! Dyson is my new favorite vacuum!